Accordion Sketchbook with Fabriano Artistico 140lb Soft Press paper: I made 3 of these and used them for sketching during NYC Urban Sketchers meetings when weather permitted. This is one of those three. 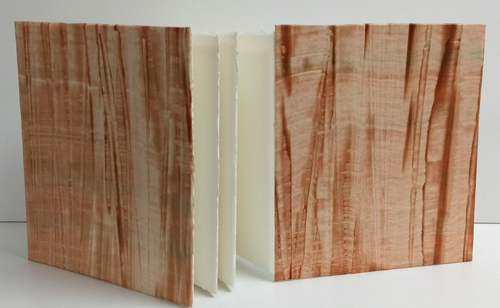 I am teaching a friend from NYC USK how to make books and last week, in lesson 4 - (first 3 lessons: pamphlet book, double pamphlet book, recycled book) we made accordion books using Fabriano Artistico 140 lb soft press watercolor paper. We tore two 8" strips from a 22 X 30"sheet of paper and glued them together with a 1/2" flap. The pages are 8"H x 7" W for a full length of 56". I used paste paper I made previously to cover the binders board that I made while she was following along. I may make one. Of course I'd love to create such terrific sketches to put on those pages!